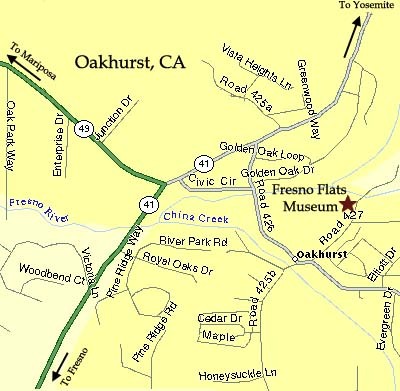 Fresno Flats Historical Park is located near Oak Creek Intermediate School and Yosemite High School on Road 427, also known as School Road. To reach the Village and Park from downtown Oakhurst, turn off Highway 41 onto Road 426. There is a traffic signal at this intersection, noted for Oakhurst’s Talking Bear. Proceed on Rd 426 for about one-half mile, past another traffic signal, to Road 427. Be in the left lane as you approach this signaled intersection. Turn left onto Road 427. Fresno Flats Historic Village and Park will be on your left in approximately three-quarters of a mile. A large, two-story yellow house, the 125-year-old Laramore Home is the most visible building as you approach the Historical Park. There is off-street parking at the front of the museum complex. We look forward to having you visit.